The gallbladder is located under the liver and near the stomach. Gallstones are pieces of stone-like material that collect in the gallbladder. Gallstones are made of cholesterol salts or bilirubin salts. Gallstones can be as small as a grain of sand or as large as a golf ball. The gallbladder can develop just one large stone, hundreds of tiny stones, or almost any combination of these. Gallstones are caused when bile or cholesterol crystalizes into stones. People aged 60 years of older are at increased risk for gallstones. Women between 20-60 years old and those with high estrogen levels are also at increased risk. People of Native American, Mexican American, and Northern European descent are also at increased risk. Many people have gallstones without symptoms, called silent gallstones. In some cases, these are treated. Gallstones may cause pain in the upper abdomen. This is sometimes called a gallbladder attack because it begins suddenly, often after a fatty meal. The pain is severe and may last for 30 minutes or several hours. Talk to your doctor about the best treatment plan for you. Laparoscopic cholecystectomy —The removal of the gallbladder through several small incisions in the abdomen. To view the gallbladder, a small, lighted tube with a camera is inserted into one of the incisions. Surgical instruments are used to remove the gallbladder through one of the other incisions. Open cholecystectomy—The removal of the gallbladder through a large incision in the abdomen. This is necessary if there is an infection in the abdomen or a great deal of scar tissue. Over-the-counter or prescription medication to control pain. 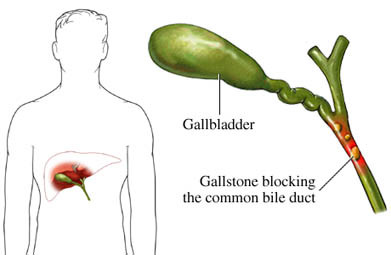 Bile salt tablets to dissolve gallstones. These medications may need to be taken for months or years until the stones are dissolved. Eat a diet low in saturated fat . Eat plenty of fruits, vegetables , and whole grain foods . Gallstones. EBSCO DynaMed Plus website. Available at: http://www.dynamed.com/topics/dmp~AN~T114033/Gallstones . Updated November 20, 2017. Accessed December 20, 2017. Gallstones. Family Doctor—American Academy of Family Physicians website. Available at: https://familydoctor.org/condition/gallstones. Updated March 2014. Accessed December 20, 2017. Gallstones. National Institute of Diabetes and Digestive and Kidney Diseases website. Available at: https://www.niddk.nih.gov/health-information/digestive-diseases/gallstones. Accessed December 20, 2017. 6/18/2014 DynaMed Plus Systematic Literature Surveillance http://www.dynamed.com/topics/dmp~AN~T114033/Gallstones : Singh-Bhinder N, Kim, DH, Holly BP, et al. American College of Radiology (ACR) Appropriateness Criteria on right upper quadrant pain. Available at: https://acsearch.acr.org/docs/69413/Narrative. Updated 2013.